Last week, we showed you this picture, and ask how you would fix what might be wrong in the picture. SCM was contracted to provide monthly safety oversight at this construction site. To be clear, we took this picture and it was part of a report provided to the general contractor. In each case, you can argue that at least some of the workers at the site knew there was an issue. Some of the rebar had protection, but not all. One of the sides of the excavation had shoring, but not all sides had protection. In most of the site, the housekeeping looks to be good, but there are cups discarded in the excavation. Of course, one of the “fixes” to these problems is to call out the areas of improvement to the site superintendent. You can listen to the reasoning for why some things had protection (rebar caps, shoring, etc.) and some did not. 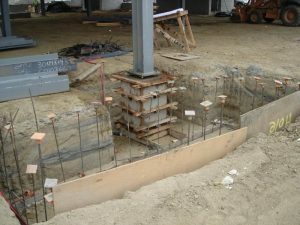 You can advise them on why it would be important to present a completed picture of safety by putting the caps on all the rebar, protecting all the sides of the excavation, and picking up all the trash. For your information, this was not a surprise inspection, the Superintendent had been advised that SCM would be on site that day. One of the points we want you to understand here is that safety is a complete picture. When you see caps on some rebar, but not all, it causes some to pause and wonder why. Why were some rebar capped but not all? Was the one that was sticking up higher than the rest considered less risky? Were the sides that were not protected considered less of a trip and fall problem? Certainly, you can understand that when you are at a site all day for months, it becomes less likely that you will see all the details. Think about your own home. How many times can you walk through your home and miss that one detail that might stand out to a visitor? Your work place might be the same. It is for this very reason that SCM recommends trading off with another safety professional to do a site inspection once in a while. If you are fortunate enough to have a large organization with more than one site safety person, trade sites. You do a site inspection at a different location, and someone else does a site inspection at your location. Or hire a safety organization like SCM to do a site inspection for you. It is too easy to become blind to things at your site that might not be as “safe” as you think they are.